Most foods consumed in industrially developed countries are made on an industrial scale. Stainless steel is the material from which most of the processing equipment is made. It is sturdy, resistant to wear and corrosion, and relatively easy to clean. Smooth surface finish is essential to cleanability. Contaminants adhere more readily and firmly to a rough than to a smooth surface and they may be much more difficult to remove from areas which are not easily or not at all accessible to mechanical cleaning. Regular cleaning is very important in order not to allow microorganisms to propagate and to spoil the foods being processed. Meat, milk, dough, cooked vegetables and other foods provide environments which are rapidly occupied by a wide variety of microorganisms, many of which may cause food poisoning. Food processing surfaces may appear clean to a naked eye and yet there may be bacteria attached to them. 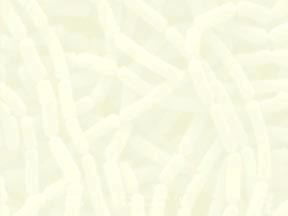 Bacteria are small, approximately 1 µm in diameter, and, thus, may easily be hiding in minute scratches. Their presence may be revealed by washing them into a nutrient medium and culturing them whereby their identity may also be revealed. However, many bacteria firmly adhere to various surfaces and would not be transferred easily. It may be of interest to see them attached to the surface. 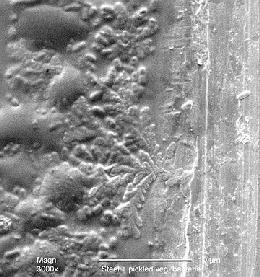 In addition, it may also be of interest to examine the food processing surface in greater detail using electron microscopy. Since it is not feasible to place large metal pieces into an electron microscope, the best approach is to replicate the surface and examine the replica. Stainless steel squares, 40 mm x 40 mm, were used in the experiments. Smaller squares, about 5 mm x 5 mm were inscribed in the steel and numbered using a sharp file. Then the steel was cleaned with acetone and its surface was replicated at various squares. For each experiment, 3 squares, 10 mm x 10 mm, of replicating tape No. 44840 were used. The area to be replicated was wetted with acetone and the first replicating tape piece was laid over it to avoid the formation of any bubbles. This tape was again wetted with acetone and the second piece of the tape was applied. Using the same procedure, the third piece was used and the acetone was allowed to evaporate. When the tape was completely dry, it was peeled off and mounted on double sticky tape attached to 13 mm SEM stubs. The replicas were then coated with gold and examined at 3 kV in a Philips XL30 ESEM (environmental scanning electron microscope). The steel disks were then coated with gold and also examined by the same electron microscope in order to compare images of the original surface with those of the replicas. Since harmless food-borne bacteria were easily available in a fermented vegetable salad, a few drops of their suspensions were placed on another steel square and allowed to dry. Areas with the dried bacteria were replicated using the same procedure as before. The steel squares were then also gold-coated and examined by SEM. A good correlation was found between the images of clean steel squares and the replicas, where the numbers inscribed by a file made the comparison relatively easy. It was, however, almost impossible to find the corresponding areas on the steel disks and in the replicas without the aid of a marker. One of the problems was the presence of other solids such as salt in the bacterial suspension. Furthermore, the "inversion" of the images - convex areas on the steel appeared as concave areas in the replica - made orientation to find the same area on the monitor was very difficult. Bacteria dried on the steel disks were easy to examine directly following their gold-coating. 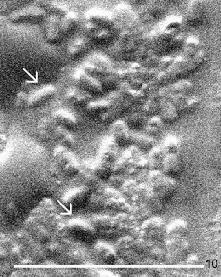 However, their drying with the other solids in air without fixation, dehydration and CPD has led to considerably poorer images (top pair of micrographs) than those of bacteria properly prepared for SEM. The replicating tape made it possible to photograph bacteria in the contaminated areas (bottom pair of micrographs) in spite of difficulties associated with inverted images and a complex mix of additional components. 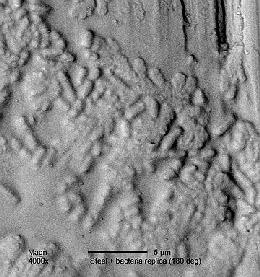 The "dimples" in the left image are actually bacteria attached to the steel surface. Inverting the signal in Adobe Photoshop produced the image shown at right thus making it clear that there were bacteria in the area captured by the replica. Scanning electron microscopy (SEM) of a fermented vegetable marinade droplet dried at room temperature on a stainless steel disk (left image). The bare steel surface is noticeable in the right side of the image. Individual bacteria are seen in the upper half of the micrograph. Right image shows details of the bacteria (arrows). Bars indicate 10 µm. Left image: SEM micrograph of a cellulose acetate replica of bacteria in a vegetable marinade droplet dried at room temperature on a stainless steel disk. Convex surfaces on the stainless steel disk appear as concave surfaces in the micrograph and make identification of the minute particles difficult. Right image: Inversion of the black-and-white micrograph shows the replica as the original particles on the steel disk. Bars indicate 5 µm. The top and bottom pairs of micrographs were photographed at 3000x and 4000x magnifications, respectively. Interestingly, the bacteria present in the dried marinate have not been absorbed into the replicating tape but provided imprints. This study is being expanded to other metal and also acetone-resistant plastic surfaces. Stainless steel equipment is common in food processing plants because it has many beneficial properties such as sturdiness, resistance to physical as well as chemical damage and thus is easy to clean. An example of criteria for newly constructed or renovated food establishments has been published by the Marion County Health Department, Indianapolis, Indiana, USA. Properties of various stainless steel types including their resistance to the foods and cleaning agents with which they may come into contact are described in New Guidance Documents Governing the Selection and Safety-Evaluation of Materials for Food Use. Home kitchen articles report on the composition and properties of cookware. Composition of metal alloys and other materials. Replication accessories and supplies include various replicating tapes and films made from cellulose acetate. 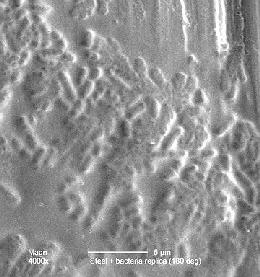 Remote surface inspection - Case study describes a procedure on how to obtain views of hidden corroded surfaces and to analyze adhering particles. Bacteria are everywhere. How do we keep them out of our food? Bacteria that cause food-borne illness. Places where food-borne pathogens are present, the way in which they are transmitted and the symptoms they cause are listed for the following bacteria: Campylobacter jejuni, Clostridium botulinum, Clostridium perfringens, Escherichia coli O157:H7, Salmonella (over 1600 types), Streptococcus A, Listeria monocytogenes, Shigella (over 30 types), and Staphylococcus aureus. How to stop food-borne illness before it starts. Careless food handling and improper cooking often set the stage for the growth of disease-causing organisms. The first rule of safe food preparation in the home is to keep everything clean - this applies to the areas where food is prepared and to the cook. Battling Food-Borne Bacteria. Scientists are currently working on various chemical washes to kill surface bacteria. One mixture that has proven effective is a combination of vinegar and hydrogen peroxide. Food-borne bacteria. There are several measures listed that can be taken to ensure not to ingest pathogenic bacteria. Don't let food-borne bacteria bug your picnic and, therefore, follow several rules to keep the food safe. Six simple steps to avoid food-borne illness: with some simple precautions, there's no reason mealtime should lead to sick time. Food-borne illness - Learn about the most common forms of food-borne illness. Outbreak - a non-profit business dedicated to training companies on how to avoid food-borne illness litigation. Dealing with foodborne illness - What to do if you live in the United States and assume that you or a loved one may have a foodborne illness. News Canada How to protect yourself from food-borne illness. Canada Health Portal - Government of Canada: Public health and safety site. The author gratefully acknowledges advice on replication provided by several microscopists through The Microscopy ListServer -- Sponsor: The Microscopy Society of America", particularly Gib Ahlstrand, Chris Holp, Robb LaChappelle, Christel Pella, Barbara Plowman, Gervais Sawyer, and N. Woody White. Laboratory assistance provided by Mr. Ann-Fook Yang is also acknowledged.